Product categories of Forging Parts, we are specialized manufacturers from China, Forging Parts, Steel Forging Parts suppliers/factory, wholesale high-quality products of Copper Forging Parts R & D and manufacturing, we have the perfect after-sales service and technical support. Look forward to your cooperation! By forging can eliminate the casting defects such as loose metal produced in the smelting process at the same time, the microstructure is optimized, the metal flow and preservation of the integrity of the mechanical properties are generally better than the same materials forgings castings. Mechanical load is high, the important parts of harsh working conditions, in addition to the plate shape is simple by rolling, welding material or, by forging. Steel began the recrystallization temperature about Wuxi turbine blade biggest blow force of 35 thousand and 500 tons of screw press and Wuxi turbine blade biggest blow force of 35 thousand and 500 tons of screw press is 727 DEG, 800 DEG C but generally used as the demarcation line, is higher than 800 DEG C hot forging; between 300 to 800 DEG C called warm forging or semi hot forging, for forging at room temperature is called cold forging. For most industries are forging hot forging, warm forging and cold forging, mainly used in automotive, general machinery parts such as forging, warm forging and cold forging can be effective in saving material. The forging material is mainly carbon steel and alloy steel components, followed by aluminum, magnesium, copper, titanium and its alloy material. The original state of a bar, ingot, metal powder and liquid metal. The cross-sectional area of metal in the cross sectional area and deformation before and after the ratio as the correct choice of forging ratio. Forging ratio, heating temperature and holding time reasonable, reasonable initial forging temperature and forging temperature, deformation and deformation velocity reasonably to improve product quality, reduce the cost of a great relationship. The general small and medium sized forging material as blank with circular or square rods. Grain structure and mechanical properties of the bar uniform well, the shape and dimension accuracy, good surface quality, easy to mass production. As long as the heating temperature and deformation conditions of reasonable control, without large forging can forged excellent forgings. Mainly speaking,based on the three different material,we can make steel forging farts,copper alloy forging parts and aluminium alloy forging parts. 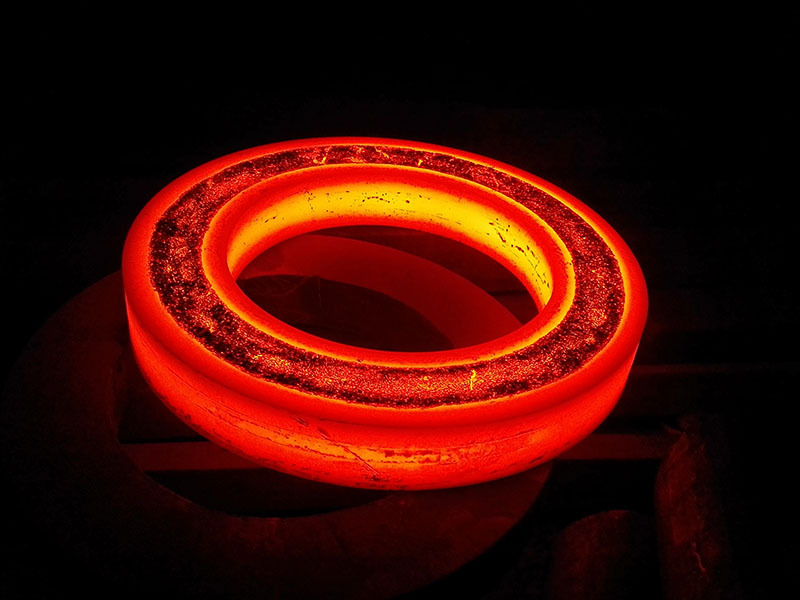 Different forging method have different processes, the process of hot forging is the longest, the general order: forging billet heating; forging; forging billet preparation; forging; trimming; punching; correction; intermediate test, test size and surface defects of forging; forging heat treatment, with in order to eliminate forging stress, improve metal cutting performance; cleaning, mainly to remove the surface oxide skin; correction; check, general appearance and hardness inspection after forging, forging an important even after the chemical composition analysis, mechanical properties, residual stress test and nondestructive testing.